Microsoft has revealed the latest device in its Surface range of 2-in-1 hybrid systems, the Surface Go. The news, which was broken on Microsoft's official Windows Blog, confirms that the Go will be the cheapest, smallest, and lightest Surface ever. The Surface Go sports a 10-inch, 3:2 PixelSense display, weighs only 522 grams (1.15 lbs), and measures in at a lithe 8.3 mm thin, while it will retail in the UK for a very competitive £380. In terms of hardware, the Surface Go comes installed with Intel's seventh-generation Intel Pentium Gold processor, which Microsoft says it has used because it balances power consumption and performance, and can be picked up in either a 4GB RAM / 64GB storage space, or a 6GB RAM / 128GB storage space model. 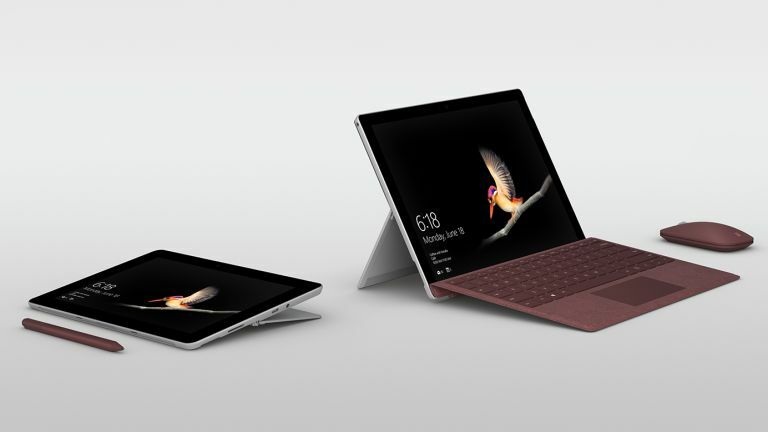 The Surface Go was also confirmed to support Microsoft's Surface Pen, which delivers 4,096 levels of pressure sensitivity, has its own version of the detachable keyboard from the Surface Pro, and comes with an in-built microSD card slot for expandable storage. In terms of ports, the Surface Go has both USB-C and Microsoft's Surface Connector inputs, as well as a headphone jack. A Windows Hello facial recognition camera is also in-built for unlocking the device. In terms of OS, Surface Go runs Windows 10 S out of the box, but that can be switched to a standard version of Windows 10 if the user wishes. Can the Surface Go challenge Apple's iPad tablet supremacy? From our perspective here at T3.com, the Surface Go looks like it could be a killer new product for Microsoft and, priced as it is, it is a very aggressive foray into Apple's computing tablet territory, which it continues to dominate right now with its new iPad and iPad Pro. That entry point is so much more accessible than that of the Surface Pro (at least twice the price) and Surface Book 2 (at least three times the price), and its form factor will make slipping it into a handbag or backpack incredibly easy. We're very excited to go hands on with the Surface Go and, considering pre-orders for the device are opening today for shipments beginning on August 6, it looks like we won't have to wait much longer to do so. Be sure to check back soon for T3.com's official Surface Go review.